If you ever find yourself backstage at Players of Utica, you might notice the name Robert Barone signed on dozens of pieces of wood comprising the set. The same Barone has been credited as mastermind of Players’ current performance space (I haven’t checked to see if he signed the girders), fifteen years in the making and currently one of the worst performance spaces in town. The focus of Barone’s new play What’s the Capitol of Bolivia is supposed to be a dotty old patriarch, which turns out NOT to be the part played by Carl DeFranco; it was during the audience Q&A following the show (a minor masterpiece of performance art) that I realized the old man was Barone himself. It takes chutzpah to compare your play to Tennessee Williams’ The Glass Menagerie (“Dickie’s arrival was sort of contrived, but so was the Gentleman Caller’s”); Barone also compared his piece favorably to The Big Chill, paused to diss Kismet (“Great music, lousy play”), and provided a valuable distinction between his work and Death of a Salesman: “We’re not Biff and Happy deciding what to do about Willy Loman.” It’s true, they weren’t. Anything staged at Players suffers immediately from a lack of technical resources. The audience waits in a dim space and the sound comes from the right rear of the house. The new chair risers seem nice until one realizes sightlines are worse than ever – with three empty rows in front of me, I was still unable to see the faces of actors who were seated on stage. Players has presented several seasons now with just eight lighting instruments – artistic masochism. Eight lights are barely enough to create one full stage wash, let alone specials and colors. As a critic, I might just dismiss the lighting on show after show, but I’ve offered free assistance to fix the problem and have been repeatedly turned down. However, the new lobby restrooms are very nice – if bathrooms are your thing, Players finally has some good ones. Eric Almleaf’s physical movement has improved over the years I have been watching him. His next step might be with a vocal instructor – there was a line in the play about how his character did commercial voiceover work, and I didn’t buy it. Stephen Wagner did his usual competent job as Almleaf’s brother, although Wagner’s dramatic notes have not changed much from role to role – I’d like to see him play a role outside of the stoic, semi-disappointed middle-aged man he has perfected. Carl DeFranco might indeed be Wagner’s father (to the credit of both) but he didn’t seem in any way to need Social Service intervention, as his character was supposed to require. Matt Harrison played the pizza delivery boy in a Santa suit (contrived indeed) and as-written should have come across as mentally ill, or perhaps mystical savant – instead, he was just another clueless, wiseass kid (we don’t need to attend theater for that.) Carrie Bostick played the thankless, unnecessary role of social services companion (do such people even exist?) – she ALMOST clicked, but her line readings needed to be a touch faster. (Bostick has not yet found her best role – I’m holding out for Laura in The Glass Menagerie, to namedrop Williams in a more appropriate fashion than Barone did.) Marilee Ensign soared above the material with a riveting, entirely believable performance in a practically unwritten role. She owned every moment she was onstage, and I regretted that she didn’t sleep with or kill several of the other characters. I would have followed that story wherever it led. Pat Stone’s direction was effective, especially in her blocking of actors. I wished she’d had better material to work with (I didn’t see her previous effort, The Importance of Being Earnest.) The set was dismal – black walls with no decoration, and no dramatic reason to be that way except resource limitations (budget, time, personnel). It should be noted that black walls are especially difficult when there are only eight instruments – lighter colors at least bounce some of what is thrown at them. I liked that Players featured three plays by local writers this summer. That’s the kind of thing the group needs to be doing – although it would be preferable if they threw some technical resources behind the productions. If I didn’t care for the shows, it shouldn’t take away from the spirit behind them – I hope they do it again next summer, and better. 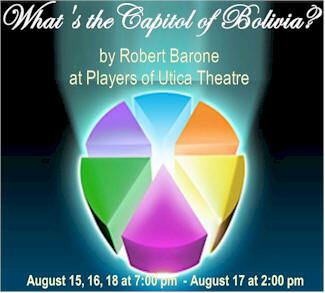 Posted in Theater and tagged Players of Utica, Theater Reviews, Upstate NY Regional Theater, Utica NY Theater. Bookmark the permalink. I enjoyed your thoughts on the new Players facility. It is still a subject-of-discussion in my household. However, we tend not to focus on what is currently happening there. Given that we live 1,000 miles away, that would be difficult. But based on what we read in social media and the on-line OD, we know there are a number of Board volunteers who are selflessly committed to the new facility’s ongoing development. —> One was renovation-minded. That with the help of local politicians, they believed the organization could obtain some unused facility/property (i.e., old church, old firehouse). On the cheap. Or perhaps even for free. And between insurance monies, donations, and sweat equity, the replacement facility could be created. —> The other was new-facility-minded. That this was an opportunity to create a wonderful top shelf place to do theatre. I have written and retracted several pieces on Players, most of which could be titled, “What the Hell is Going on at Players of Utica?” In my experience, non-profits and churches attract those who could NEVER lead in for-profit settings, Bob Barone among them. I agree that some have demonstrated selfless commitment – that’s not the same as effective commitment. I sat on a fundraising committee last summer and asked the question, “How much money are we trying to raise?” The answer was, “As much as we can.” So of course, the fundraiser was successful. In reality, the efforts of more than 10 people for 4 weeks yielded less than $5,000, which means that about 199 more fundraisers were needed to finish the job. Between being an employee and a volunteer, I’ve logged 10,000+ hours with various community organizations. Churches, arts organizations, etc. And it has been my experience that within those domains, people seem to get a skewed notion of their own skill set. They lose sight of what they are good at. And what they are NOT. And the fallout from that can be horribly toxic. You’re right – it’s the toxic fallout that we need to watch out for. I’ve been caught in that more than once.